Easily sell your merchandise on this 4-Way Grid Tower! This tower comes in a stunning Chrome finish that looks great in any setting and will attract more customers. 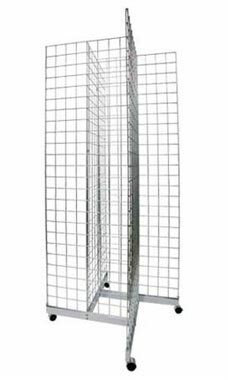 This unit includes 4 grid panels, connectors and a base with casters. Measuring 36'' x 36'' x 6½' tall, this unit will present you with a lot of extra space for you to display your merchandise. Accessories sold separately but are also available here at Store Supply Warehouse. In stock and available for immediate shipment.